How to get there: Geneve is a good airport if coming from far away. Alternatively, approach from the south starting from Torino. From the Geneve airport, head south on E-25 and follow signs to Chamonix. Take the tunnel under Mont Blanc (11 kilometer, Euro 32.50, note that one may buy a round-trip ticket at a good discount.) and exit in the charming Italian village of Courmayeur shortly after leaving the tunnel. From Courmayeur, continue (south-east) parallel to E-25, but on the local road SS-26. After approximately 25 kilometer, turn right, cross the autostrada and follow signs for SR-23, Villes Dessous and Valsavarenche. Drive SR-23 to its very end, you go through the small village of Valsavarenche and after about 26 kilometer, the road ends with a large parking area in a tiny place called Pont. Park here, this is the trailhead, location N45:31.477, E007:12.048, elevation about 1970 meter. First, to the hut: From the parking, head further into the valley, there is a ski track on the left side of the creek. Soon, the trail bends more left as it crosses on a small bridge and heads into the trees. This is also quite close to a low, old building structure having a row of several windows facing out. The trail climbs the steep hillside in several switchbacks. Higher up, the slope is somewhat more gentle. 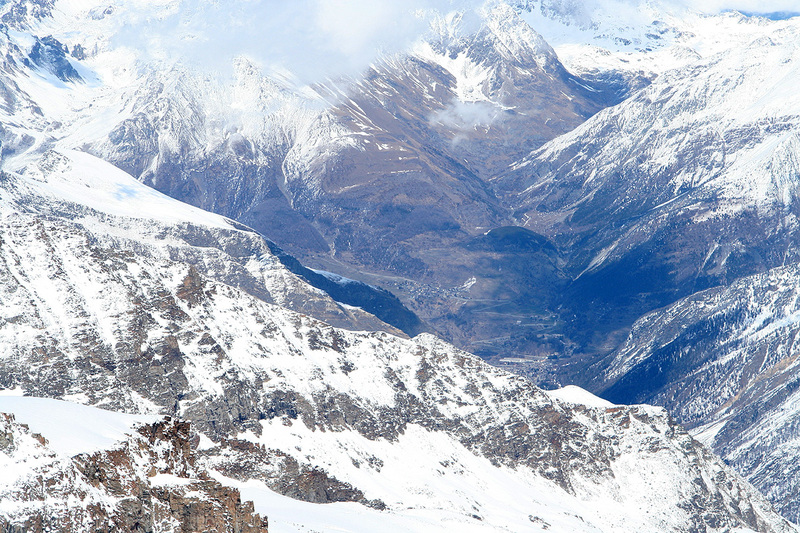 There are several variations in order to stay on snow as far down as possible. 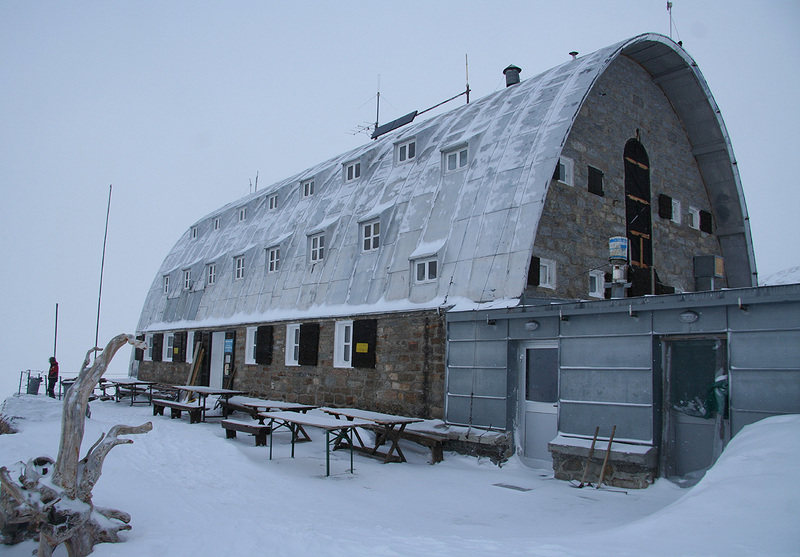 Basically, continue straight uphill until you arrive at the very characteristic Refugio Vittiori Emanuele at 2735 meter elevation and location N45:30.755, E007:13.785. This hut has a capacity of about 140 guests. It is open from early April until late September. Unlike some huts, there are many separate rooms with 5-8 beds each. The hut is well managed and serves meals as well as selling snacks and drinks, even post cards. The rooms have a large supply of warm blankets, visitors should bring a (light weight) "sheet sleeping bag" to ensure hygiene. Reservations are highly recommended. The hut can be called dialing +39-0165-95920. 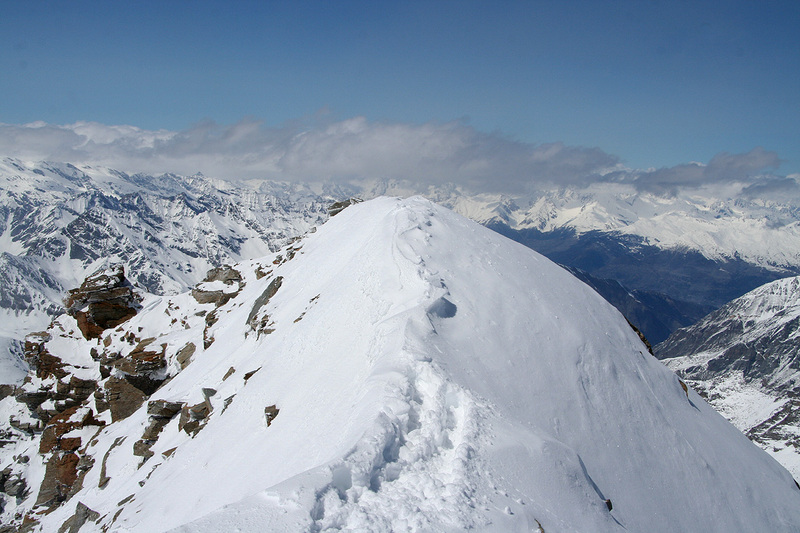 Next, to the summit: From the refugio, head out and up the (north) slope, note that this is NOT further up the valley that you ascended in order to reach the refugio. 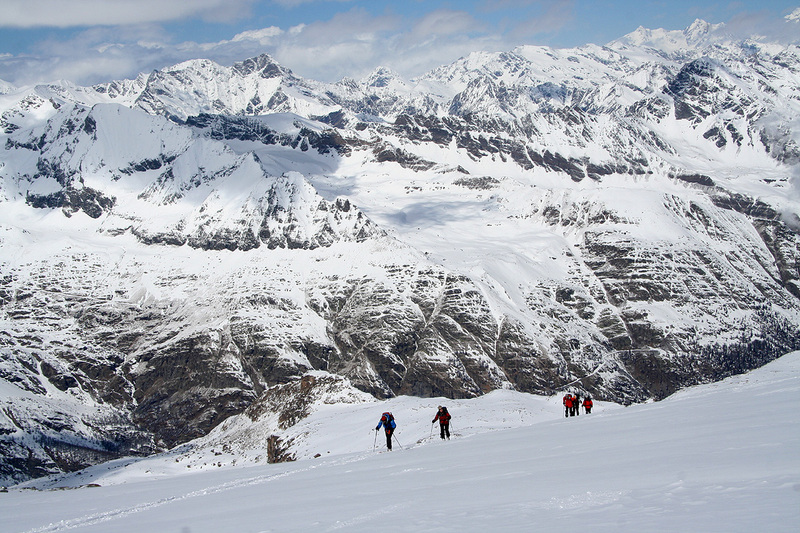 Walk around the (east) end of the refugio, then set your course gently uphill. That is, as you exit the main door from the refugio, you want to go exactly in the opposite direction (180 degrees). After an initial slope, there is a distinct valley heading further uphill on your right. Take this route, there is steep rock on your right and a moraine ridge on your left. Further into this valley, a glacier ascends from your right side. Either climb/ski up this (medium steep) slope, or make a somewhat more gentle ascent by an arc-shaped traverse from left to right near the very end of the valley. Above this slope, the terrain is again more gentle and continuing in the same direction, you approach what looks like a shallow and fairly broad saddle. 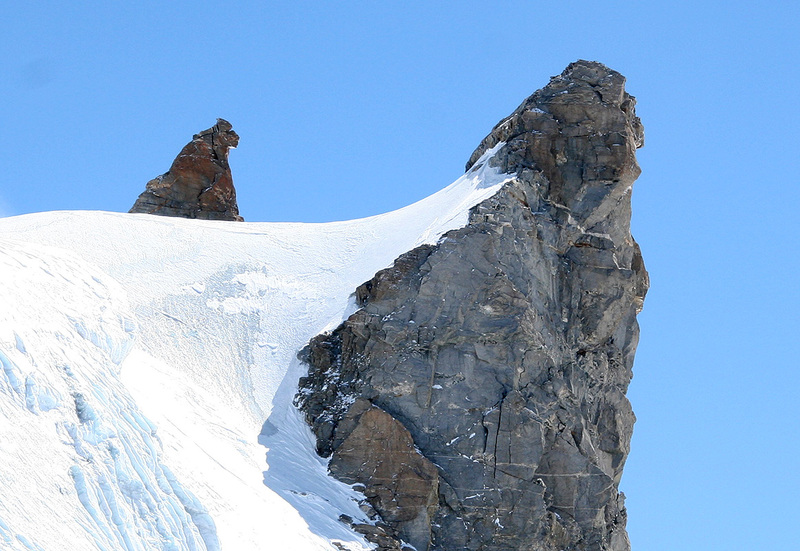 It is easy to see the next section of the route, a new glacier that climbs higher on your left side. Proceed ahead until you reach about 3400 meter near location N45:30.848, E007:15.055, then turn left and ascend this somewhat steeper slope on its right side. 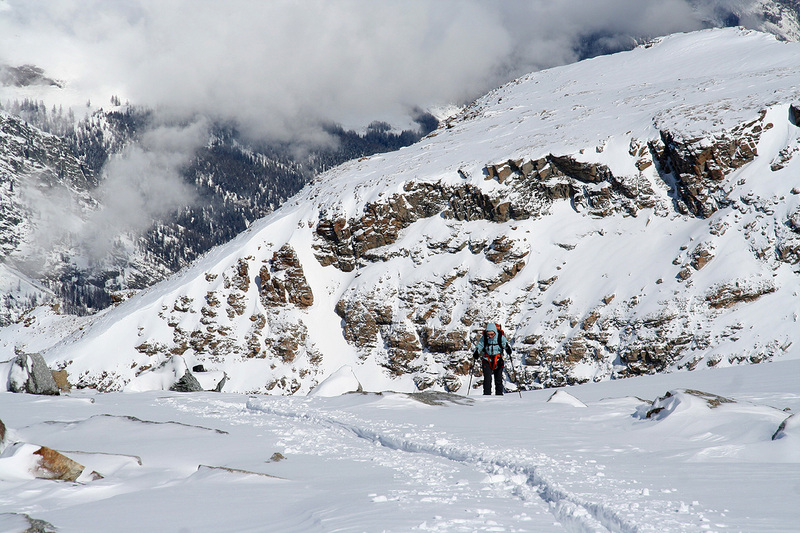 This slope is steep enough to carry some avalanche risk if the conditions are unfavorable. Above this step, the slope again is much more gradual. You will observe a steep glacier ahead on your left side. In fact, another very distinct valley is hidden between your position and this icefall. Proceed ahead, then connect without any difficulties, to the ridge that form the upper right side of this valley. Higher up, you again approach a saddle, you are now approximately at 3850 meter, location N45:30.768, E007:16.011. 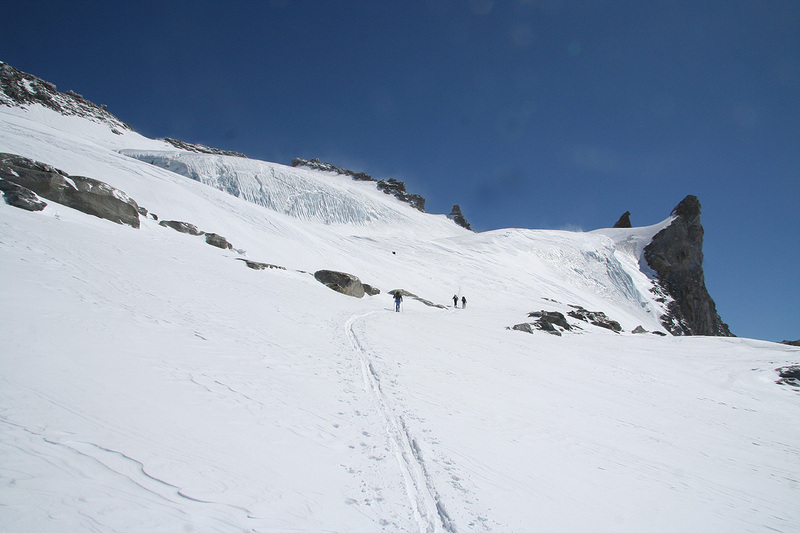 The next section of the route now climbs a relaively short slope on the glacier that is now on your left hand side. When I was there, this glacier had ice and very little snow. Thus, skiing was not an option and I left my skis here and completed the climb on foot (with crampons). 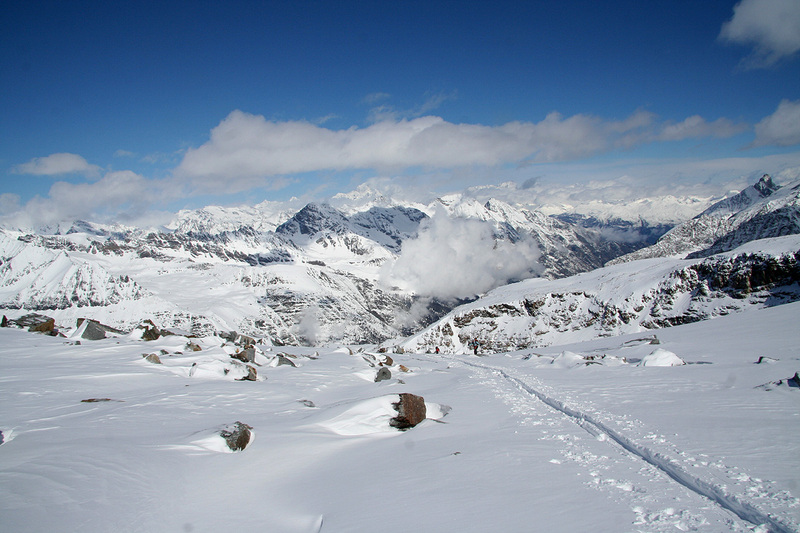 With different snow conditions, one may be able to continue skiing to the base of the next col, thus reaching 4000 meter on skis. Higher up, the glacier becomes almost flat. 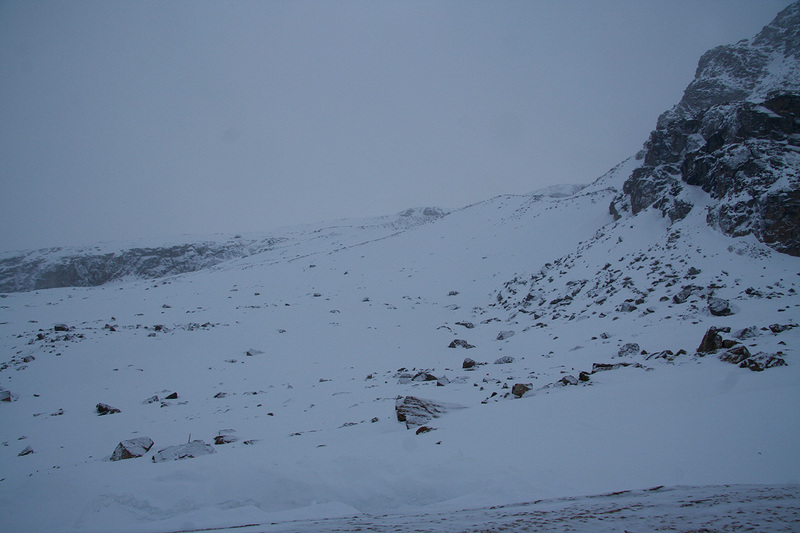 The route now proceeds across this glacier, then up to a col that is pretty obvious. There is another col further right that should be ignored. 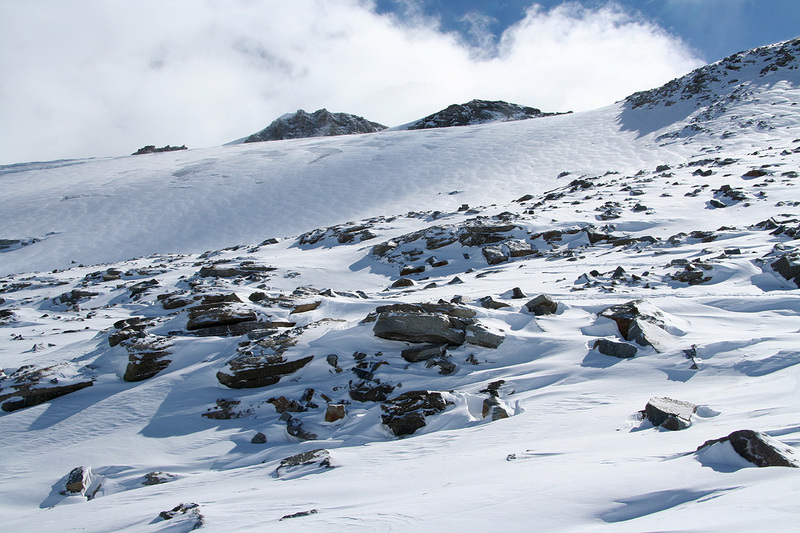 The base of a short, but somewhat steeper slope to this col is located at N45:30.959, E007:16.127, the elevation is now very close to 4000 meter. 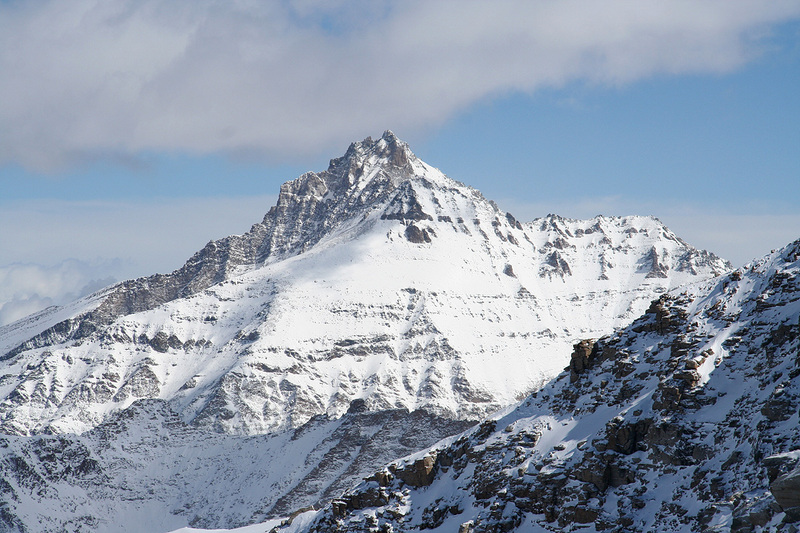 From this col, the route traverses a bit below the ridge on its left side. 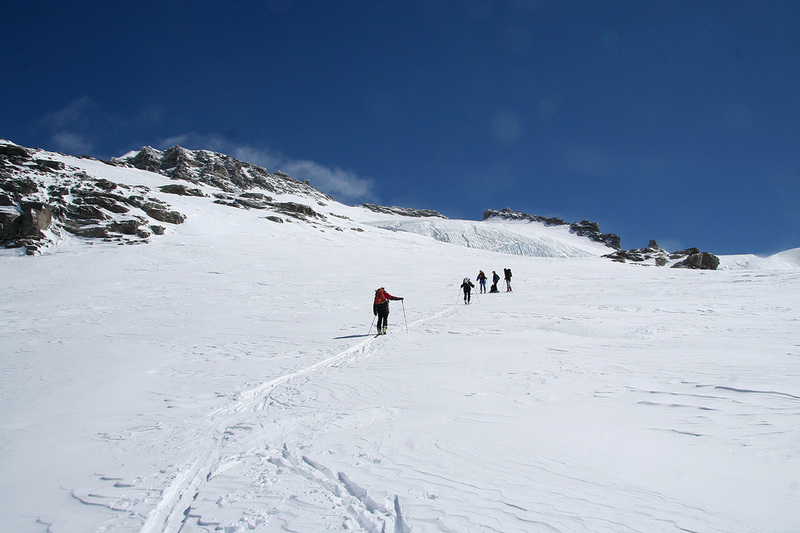 The terrain is not difficult (YDS class 2), until one arrives in a new distinct col. The summit block that has the well known statue of Madonna on top, is now up on the right. The short pitch up there requires easy climbing (YDS class 3). In the season, there is often a fixed rope here. 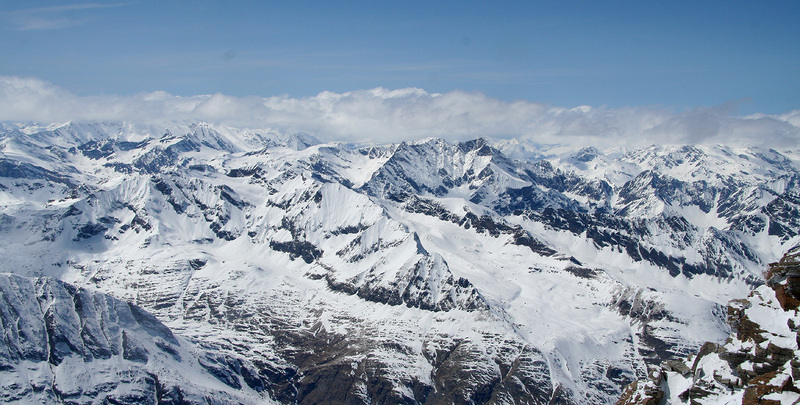 The highest point on Gran Paradiso is located on the ridge that continues north, ie. further to the left. There is a steep step in the ridge that might be climbed, however, the easier route circumvents this obstacle to the left. Descend a short and easy pitch down through a somewhat narrow passage directly below the big summit block. Continue the traverse horizontally, then regain the ridge by easy scrambling (YDS class 3). 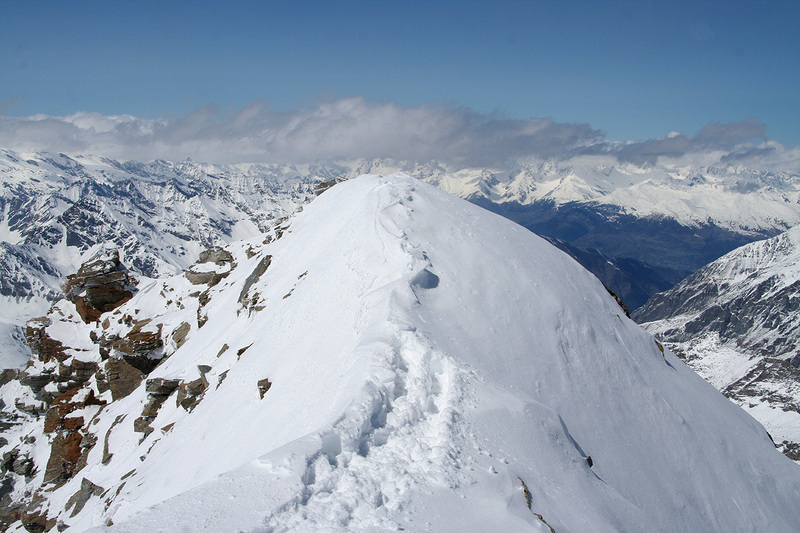 Unlike the Madonna summit (which is slightly lower), this summit ridge is quite long. 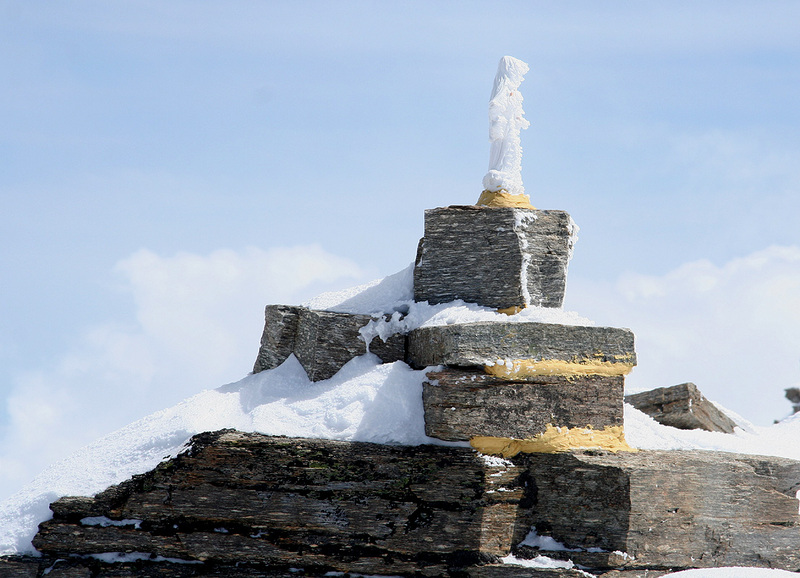 There is a "mini-madonna" near the point of arrival. 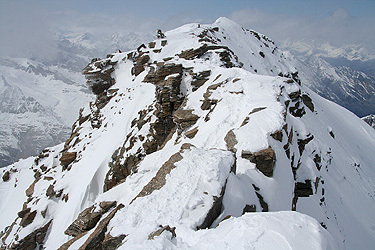 One can easily walk on top of this ridge further north to the highest point. Comments: This was a trip together with my friend Arnt. Arnt arrived in the afternoon on Thursday and we left Bergen with an early flight via Amsterdam to Geneva on Friday, April 18. The rental car was waiting and after a short drive we parked at the trailhead around 1600. We started hiking around 1615 and after skiing up the first part on the valley floor, we had to carry the skis as the good trail climbed the steep hillside. Higher up, we skied while the weather took a turn for the worse. Arnt felt the altitude well before arriving at the refugio Vittorio Emanuele (N45:30.755, E007:13.785, 2735 meter) at 1900. Thirteen guests were already there as we arrived just in time for dinner. A private room, what a luxury! 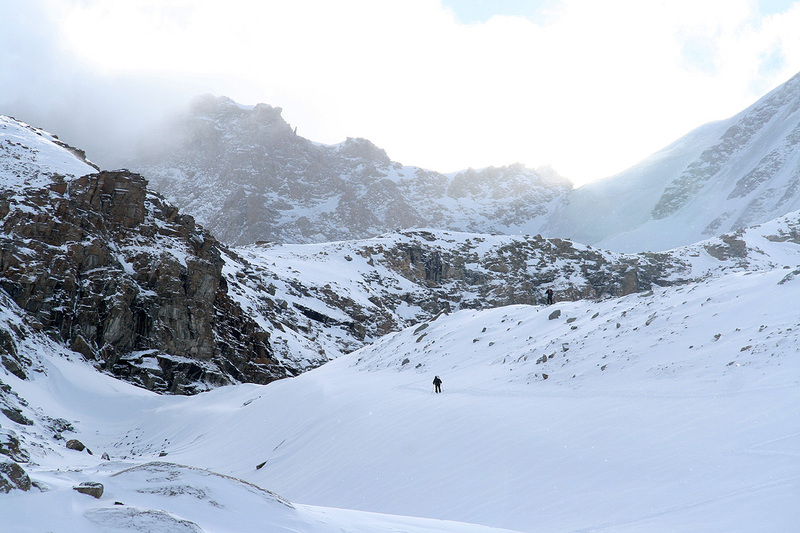 However, Arnt was severely affected from the abrupt change from sea level to 2700 meter and, unfortunately, the next morning it was evident that he would be unable to continue the climb following the schedule of a two day trip. It was still snowing and completely cloudy at 0700. Despite of this, I decided to prepare and then ski uphill while evaluating the weather situation. 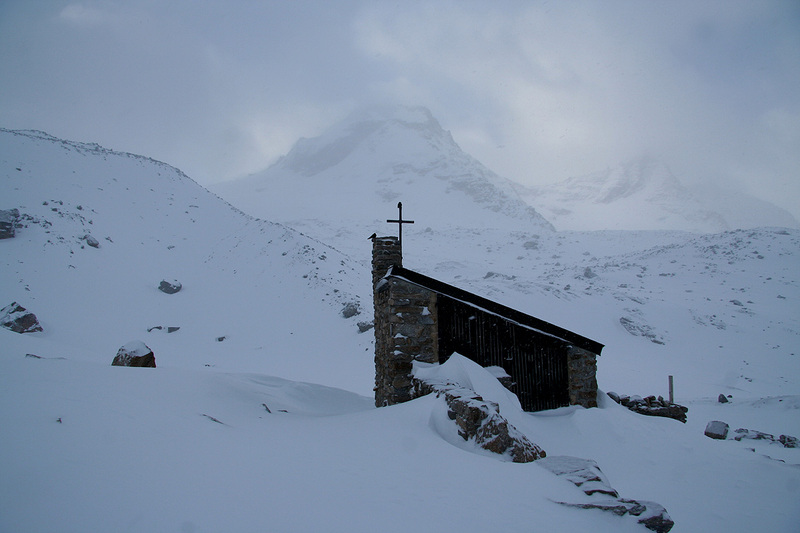 Thus, I left the refugio at 0815 and started skiing up the first hill. A man and a woman had started out about 5-10 minutes earlier, I was happy to ski in their tracks, breaking trail required more than an average effort. Unfortunately, they went the wrong way. Sort of understandable, as their route was well marked with red and green flags. Instead of turning right up the small valley, these flags marked a route that traversed the terrain more or less in the same direction as our initial course starting out from the refugio. 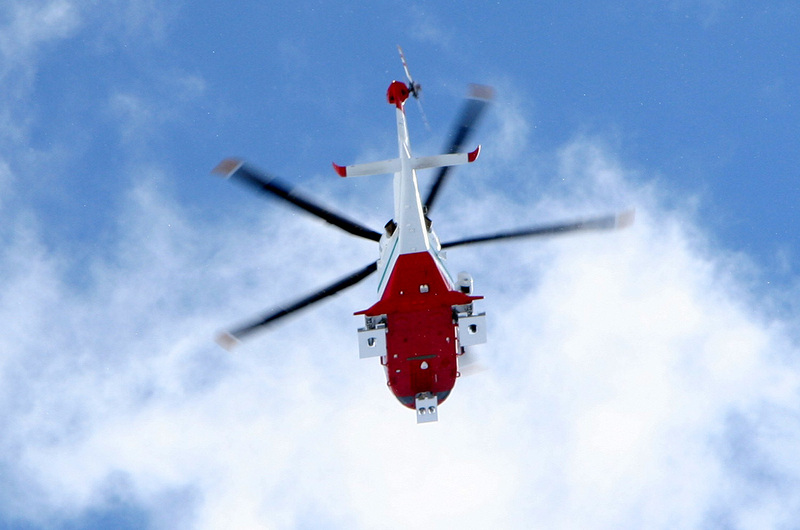 A helicopter kept flying above me, it seemed to patrol the area between the summit and the refugio, then three skiers came down the slope collecting the flags as they skied. The weather steadily improved and the view back was already outstanding. The mistake now became clear, but we were already on the wrong side of the moraine that formed the left side of the valley we should have been in. Skiing on top of this moraine, we eventually made a somewhat steep descent back into the upper part of the correct valley. The glacier slope straight across looked fairly steep, they always do when you look at a slope in this way. Still, it seemed like a more natural route of ascent to make a long curved traverse essentially at the end of this little valley. Such a route would make us arrive at the top of the glacier. Well, as long as I did not break the trail, the choice certainly belonged to the man up front. He chose the direct approach, straight up the slope in short zig-zags. Allowing a bit more distance between each turn would certainly have saved us energy and effort, but alas, this was still his call. I was thankful for having a strong, young man up front and should really not even think about an alternate route as long as I definitely preferred the track over making one myself. Higher up, the slope quickly leveled and became almost, but not quite horizontal as I skied towards what looked like a shallow saddle. The views only got better looking back, I could see the outline of the valley from where we started yesterday as well as the landscape beyond. The slope of the next glacier, now going left looked even a bit steeper than the previous one. We again started a zig-zag ascent. The new snow was knee deep and at least partly resting directly on a fairly distinct crusty snow surface below. The conditions called for some care relative to avalanche danger. The track stayed close to the rocks and the guy in front did a great job breaking trail. We emerged on the more gentle slope above and the scenery started to show exceptional qualities. Sharp horns piercing the sky, a green icefall slightly to the left. Neighbor peaks were not higher anymore, a sure sign that this route led to the top of a gigant. The route was now pretty obvious, an elegant (quite wide) snow ridge would take us to the base of this top glacier in a place where the slope would be quite easy to negotiate. It turned out that this final glacier had no new snow. 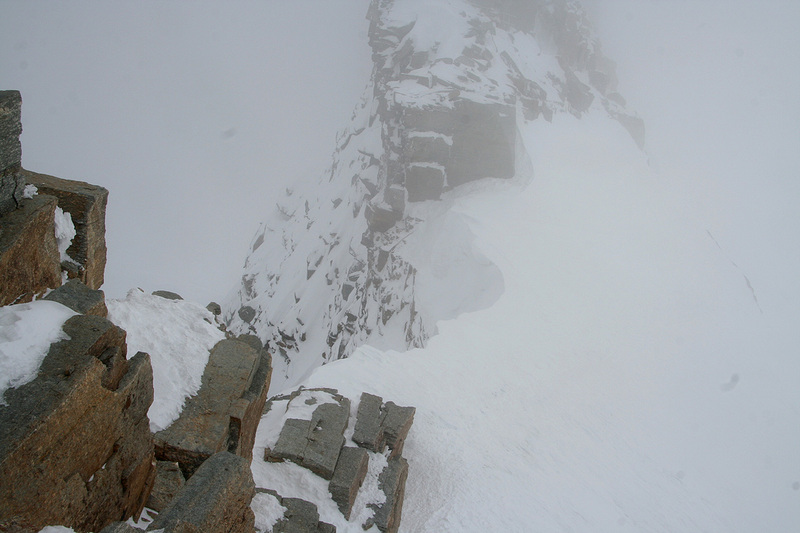 The wind was quite strong, snow was drifting and I needed to put on my jacket before attending to the crampons. It seems likely that the local weather pattern is responsible for the lack of snow on this part of the glacier. 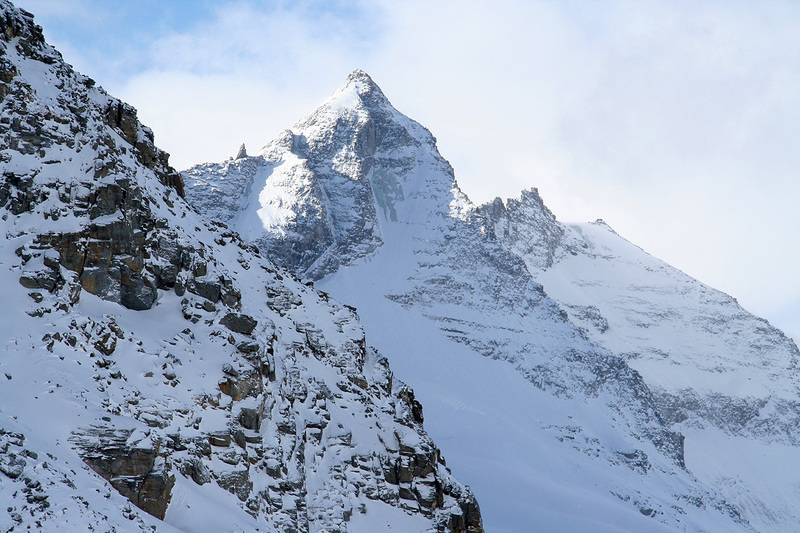 With crampons, it was an easy matter to ascend the steeper part. Higher up, the snowdepth returned to half a meter. We ran into a couple of crevasses here, one of them being big enough that a fall would have been unpleasant. The guy in front breaking trail (not the same man as when I started out), did a great job in all the deep snow. I checked my GPS just at the base of the final, short slope to the col and it showed that the 4000 meter level had been crossed. This slope as well as the short traverse to the next col caused no problems whatsoever. 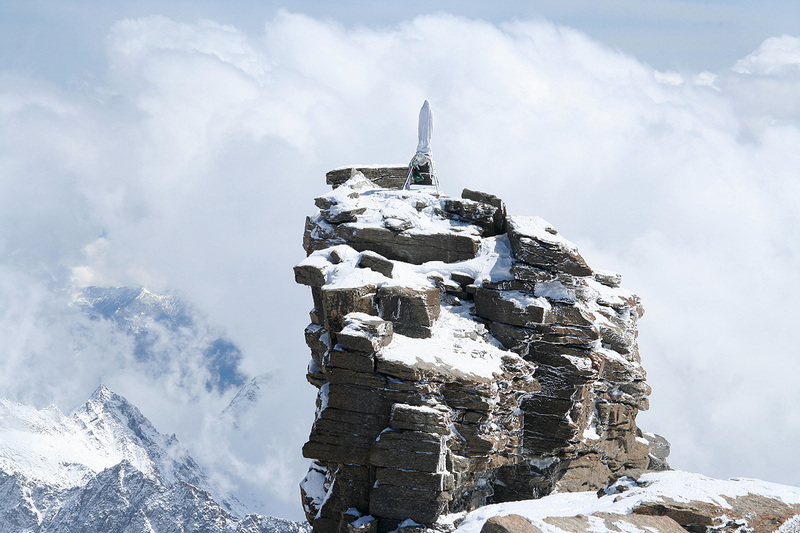 It was evident that the other people wanted to climb the Madonna summit. 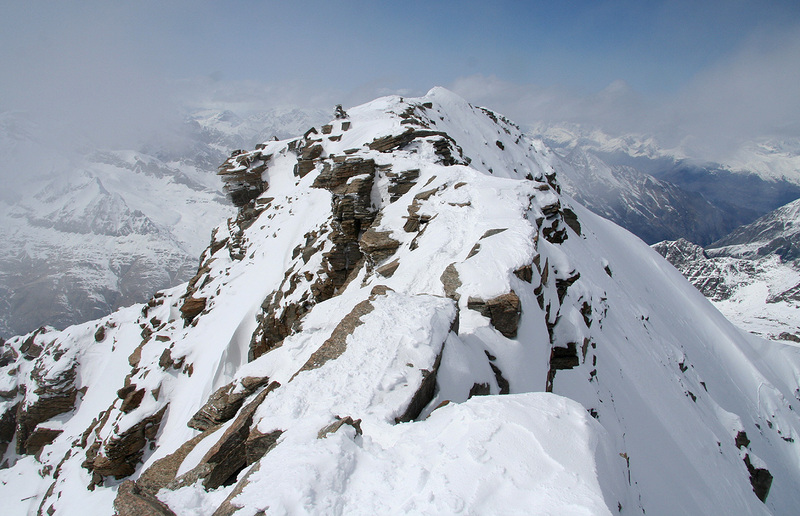 Instead of waiting around there I immediately proceeded to climb the main summit ridge that also holds the highest point of Gran Paradiso. 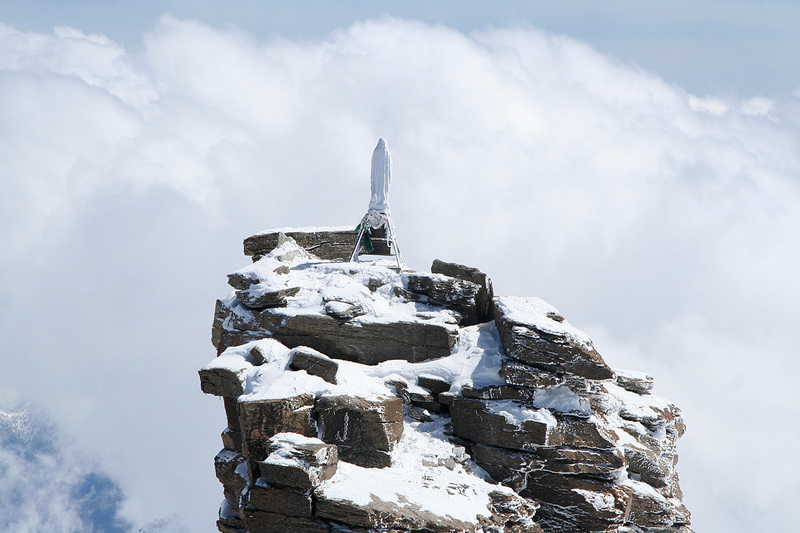 The time was 1415, the climb had taken me 6 hours, partly because of the deep new snow, partly reflecting that I could have been in better shape. 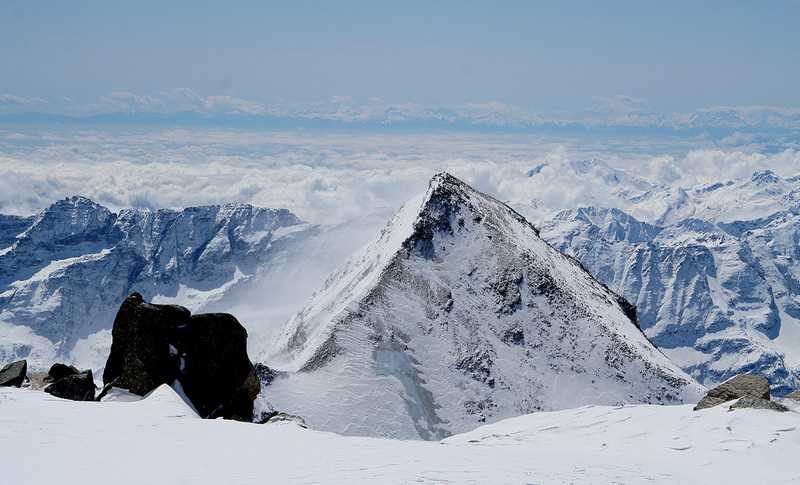 The summit ridge is quite distinct, but never extremely narrow. The south end is quite close to the Madonna summit, one can then walk north on the very top of the ridge to what seemed to be the highest point. 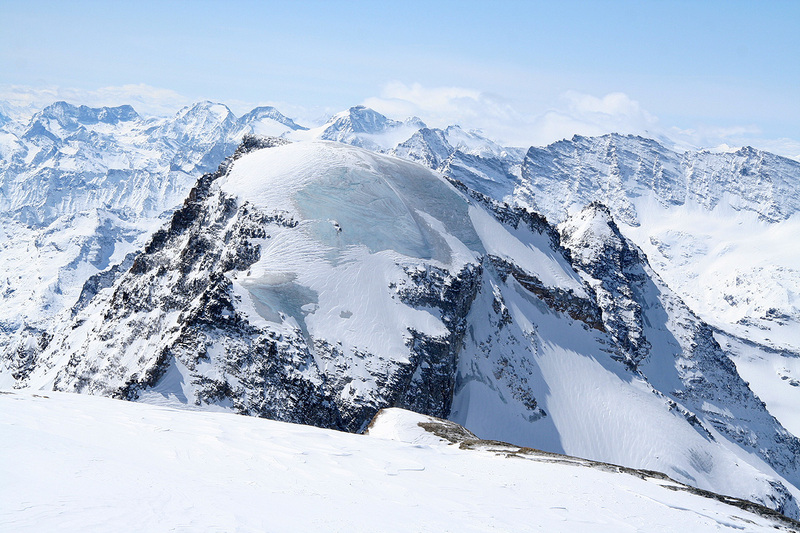 In winter, the very highest point was a small dome of snow. I walked right into the small hump in order to both touch it and to better look across it, but decided to leave it alone, since the ridge went downhill from here. No great day for panorama pictures, it seemed that clouds covered up the horizon all around. Just here, "in Paradise", the sun was shining and the wind was calm. The views to the nearby landscape was just great. I left the summit after 30 minutes and traversed down from the summit col at 1500. Another 1.5 hours of mostly down hill skiing brought me back to the refugio at 1630. 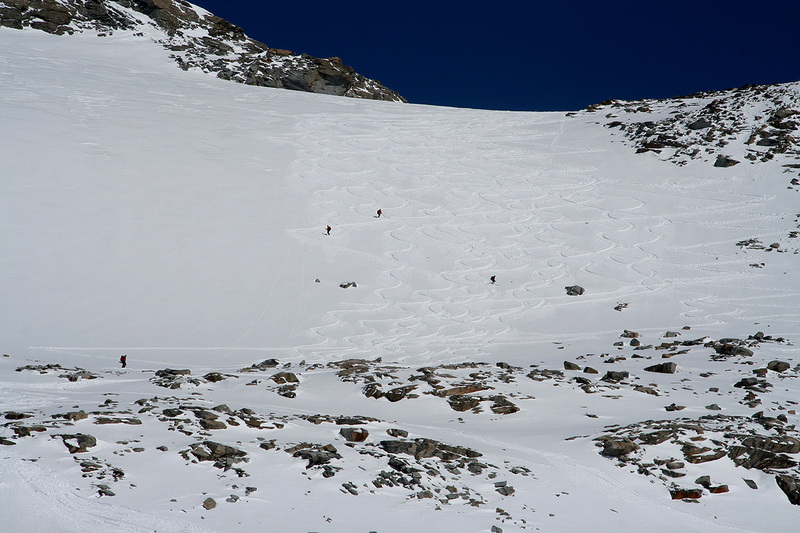 It was interesting to observe that all fear of avalanche when ascending seemed to evaporate completely when the skiers headed back down. Lots of powder made for great fun. Arnt was outside enjoying the sun. I was happy to hear that he was now back in shape and that he had skied up to 3000 meter a bit earlier in the day. We headed back down to the car around 1700, arriving at 1815. The day was concluded with a nice (trout) dinner in Courmayeur before we drove back to Geneva and airport accommodation. Our flight back to Norway left already at 0655 on Sunday morning, getting me all the way back home by 1200 - noon. Bergen had just gorgeous weather contributing to a very memorable weekend. Warm thanks are due to Arnt, without his encouragement, enthusiasm and good company, Gran Paradiso would have remained unvisited. He has documented the trip with additional beautiful pictures. The villages Cogne and Gimillian. Summit view I, the view is west. Summit view II, the view is north along the summit ridge. Summit view III, north continued from the previous picture. Summit view IV, the view is further north-east. Summit view V, rugged peaks (east).